Who is the Hotel Success Handbook for? What’s in the Hotel Success Handbook? Who wrote the Hotel Success Handbook? Why the Hotel Success Handbook? 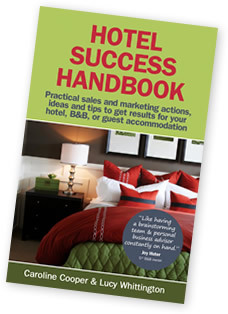 For seasoned hoteliers and those new to running a hotel or B&B alike, the Hotel Success Handbook is packed with practical tips and actions to improve business results. De-mystifying and explaining good sales, marketing, operations and training practices the Hotel Success Handbook is a guide for owners and managers of small hotels, B&Bs, Restaurants with Rooms, Inns or other guest accommodation. The Hotel Success Handbook contains over 40 combined years of hospitality training, business coaching, sales and marketing experience from Caroline Cooper and Lucy Whittington. The Hotel Success Handbook is a practical guide to marketing actions, sales tips, staff training ideas, operational must dos (and don’ts) to help owners and managers fill their hotel, B&B and guest accommodation with the guests they want. There is a huge opportunity with current demand for ‘staycations’ and people looking outside of their usual ‘fly and flop’ package holidays to make independent hotels, B&Bs and other guest accommodation businesses a huge success. But it is hard for those running them to know where to start to make that happen. Should you be collecting fans on Facebook? Attracting a following on Twitter? Still printing glossy brochures? Investing in a booking system? Going organic? Offering all-inclusive? The Hotel Success Handbook asks the right questions and shows you how to use the answers to push your hospitality business forward, and make it the success it deserves to be.